Is it a 46° halo or a supra/infralateral arc? Supralateral arc + 46° halo. The brightly coloured arc touching the circumzenithal arc is a supralateral. This arc always touches the CZA. A short distance below it is a faint 46° halo. Mouse over the image for an enhanced view. The 46° halo is clearly separated from the CZA when the sun is less than 15° or greater than 27° high. This can help in distinguishing between 46° and supralateral arcs. Brian Hartmann took this image of the Fairbanks, Alaska display of 6th March 2002. The sun was 11° high. 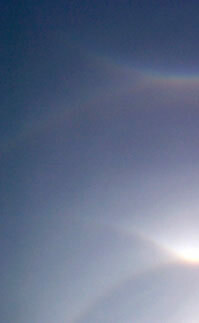 Other arcs, from base upwards, are a weak 22° halo, intense upper tangent arc and a faint Parry arc. Image ©2002 Brian Hartmann, shown with permission. 46° halo or a supralateral/infralateral arc? The 46° halo is very rare. Most halo fragments seen two hand widths from the sun are actually supralateral or infralateral arcs. Here are some guides to help in distinguishing them from the 46° halo. Try to apply as many criteria as possible when making a decision. When the sun is higher than 32° a supralateral arc cannot form . However, a very high sun can produce infralateral and circumhorizon arcs approximately 46° below the sun. The sun was high when Mitsy Krzywicki of California imaged these halos. The lower colourful halo some 46° below the sun is an infralateral or circumhorizon arc. 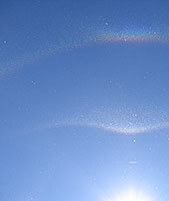 Note the greens and blues which would not be present in a 46° halo. The intense upper halo is a circumscribed rather than a 22° halo. A supralateral arc always touches a circumzenithal arc. The 46° halo is below the CZA and separated from it when the sun is lower than 15° or higher than 27°. The graph shows the separation between the 46° halo and the CZA. At solar elevations of 15 to 27° it is not possible to tell the 46° halo and supralateral arc apart by this method. A strong upper tangent arc and weak or equal intensity 22° halo indicates a supralateral arc. No (or a weak) upper tangent arc and a strong 22° halo indicates a 46° halo. The 22° halo is very weak compared to the tangent arc in this diamond dust display imaged by Franck Schwitter near Crans Montana in Switzerland. This, together with the bright colours of the upper arc indicate that it was a supralateral. Indicate supralateral and infralateral arcs, the two arcs cross at the parhelic circle whereas the 46° halo would cross it without any discontinuity. Intensely coloured supra- and infralateral arcs cross at the parhelic circle in this display seen in Switzerland by Alastair Adams. The 46° is uniformly bright around its circle. 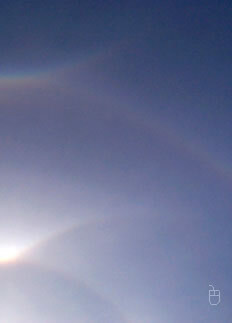 A supralateral arc is brightest at its top for solar altitudes greater than 15° - but variations in clouds can mislead. A supralateral arc tends to have more saturated (brighter) colours than the 46° halo. The presence of blues and greens are strong indicators that the halo is a supralateral arc. Colours are not definite evidence for one or the other.